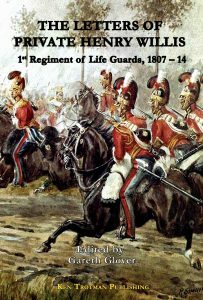 Whilst searching through the Household Cavalry Archives at Windsor a few years ago, I discovered a number of short but very interesting accounts of Life Guards in the Peninsular War and at Waterloo. One of the most interesting and also the most poignant is the short set of letters of Private Henry Willis who joined the 1st Regiment of Life Guards in 1807 and having sailed to Portugal, served at the Battle of Vitoria without receiving an injury. Unfortunately a severe fall a few days later led to sepsis in his leg and his early death. Henry Willis was the youngest son of Richard Willis, Attorney at Law, of Haslingden and Alice his wife. They lived at Laneside, Haslingden, for which property the copyhold belonged to Alice. Of their four children only Mary, born 1773, and Henry were living at the time the letters were written; Adam, born 1769 had died in 1795, and as Henry refers to ‘my sister’s will’ it would seem that Anne, born 1771, had also died. There is no record among the church papers of Henry’s birth, but it would appear that he must have been born around 1790. His letters written to his family describe his joining the regiment and the regiment’s involvement at home in quelling unrest including the arrest of Sir Francis Burdett in 1812. It is also interesting to note the sizeable sum of money that a private soldier could command, way beyond what many officers in the line regiments would be able to muster. There follows his description of Lisbon and the march to join the army along the Spanish border. The advance to Vitoria is described, with his part in the action, but there his letters end abruptly. But the story does not end there however, for a very interesting and significant series of further letters are attached. These are quite unique, written by fellow privates in the Life Guards to his family back in England reporting his unfortunate death, his personal belongings and moneys owed to him. In fact Thomas Sutcliffe seems from this date to have become a frequent correspondent to Henry’s family.